Judges Peter Flockhart (left) and Bran Jankovic. Scottish beef producers must deliver to specification to maintain the premium which Scotch Beef commands in the market place. 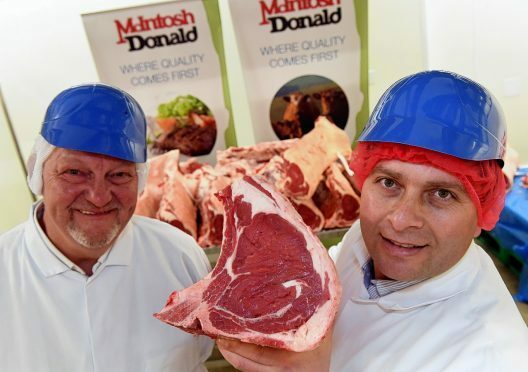 That was the uncompromising message from McIntosh Donald site director, Alan McNaughton, at the preliminary judging of carcases at the company’s Portlethen meat plant for the Tesco best Scotch steak competition at next month’s Royal Highland Show. A total of 128 carcases from a record entry of 182 cattle qualified for the competition which means that 54 failed to meet the spec for either weight or level of fatness. McIntosh Donald was the first company more than two years ago to impose penalties on carcases weighing over 400kg – a move which has been quickly followed by most other meat processors. “The average weight of carcases processed at Portlethen was 15kg lower in April than the same month last year but many farmers are still not moving quickly enough to get more cattle delivered on spec,” said Mr McNaughton. Cattle generally needed to be slaughtered at a younger age and fast finished after weaning to meet the weight target, rather than going through a store period. Mr McNaughton was supported by carcase judge, Peter Flockhart, sales director of Campbells Prime Meat Ltd of Linlithgow. He said: “We supply leading restaurants and hotels throughout Scotland, as well as our mail order business for fresh beef, and we are looking for rib eyes of 2.5kg to 3.5kg and strip loins of 6kg to 7kg to meet the requirements of our customers. Mr Flockhart judged the competition along with Bran Jankovic, executive chef with Saltire Hospitality of Edinburgh, who praised farmers for the “lovely beef” in the competition and congratulated them on producing beef of such quality. He added that demand for beef was still strong but price was becoming a bigger issue because of the minimum wage legislation which was driving up labour costs and putting financial pressure on hotels and restaurants. Steaks from the 12 winning sirloins will be grilled on the Tesco stand at the Highland Show on Friday, June 23, and judged on eating quality by an expert panel. The 12 finalists are as follows: J. Townsend, Berrytop, Netherley, Stonehaven (Charolais cross steer, 366.3kg, R4L, 22 months and nine days); R. Littlejohn, Corfeidly, Glassel, Banchory (Simmental cross heifer, 316kg, R4L, 23 months and 15 days); R. J. and B. Milne, North Bethelnie, Oldmeldrum (British Blue cross steer, 348.3kg, -U4L, 17 months and 11 days); Netherton Farms, Garlogie, Westhill (Simmental cross steer, 349.4kg, R4L, 20 months and 18 days); A. and C. Watson, Glasslaw, Dunnottar, Stonehaven (Limousin cross heifer, 340.6kg, -U4L, 19 months and 15 days); W. G. Henderson, Nether Toucks, Stonehaven (Limousin cross heifer, 318.8kg, -U4L, 18 months and five days); K. Stewart and Son, Cocklarachy, Huntly (Limousin cross steer, 319.3kg, -U4L, 14 months and 14 days); G. Robertson, Tillyorn, Corse, Lumphanan (British Blue cross steer, 369kg, U+4L, 18 months and 12 days); Firm of N. Cowie, Bilbo, Crimond, Fraserburgh (Limousin cross heifer, 278.7kg, R4L, 12 months and three days); R. Green, Little Kilblean, Oldmeldrum (Aberdeen-Angus cross heifer, 324.8kg, R4L, 23 months and seven days); L. Grubb, Mountpleasant, Ardallie, Mintlaw (Aberdeen-Angus cross steer, 269.8kg, R4L, 14 months and 28 days); A. and E. Wyness, Midtown of Barras, Catterline, Stonehaven (Aberdeen-Angus cross steer, 339.8kg R4L, 19 months and four days).